Buckle up for the locally based band Slick Velveteens and their their seven-track, self-titled album. From start to finish, the four-piece group rocks n rolls between traditional rock, garage-punk rock and indie rock. The album is primarily high-energy and groove-inducing. A characteristic of rock n roll, many of the songs are more instrumentally-driven with more time dedicated to solos on the electric guitar and with fewer lyrics that can often cause vocals to fall somewhat into the background, rather than serving as the focal point of the song. There are female and male vocal trade-offs, while sometimes singing simultaneously. Depending on who sings, it can often change the perceived genre of the song, though each are versatile and dynamic. 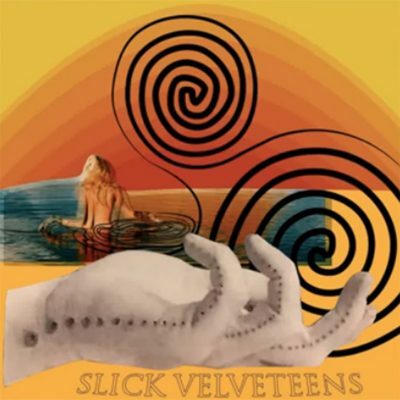 Slick Velveteens can take on a song, such as “Tell Me Twice (Don’t),” that is fast-paced and fun, nailing the classic rock n roll track that treads more on the garage-punk rock side. Then, they deliver a track like “Crooked Stare,” which is both a little indie and a little rock. The first part of the song incorporates more acoustic and drumming in combination with the electric guitar and bass supplementing the rhythm. Kenz Waldon is the main vocalist on this track, delivering a depth-filled croon perfectly paired with the comparatively acoustic elements. The song isn’t a sweet acoustic track, though. It shifts to and from the rock n roll style, with heavier electric guitar strumming and drumming, then calms down again. Waldon seamlessly transitions, too. She simultaneously grows more powerful while lowering her voice to a growl and grunt without overdoing it. The band goes all in with all instruments from the start on “Mind Trip,” in a garage-punk sort of way. First dominated by male vocals at the forefront, singing “Was it something I did?” then soon accompanied by Waldon. Not in particular order, they sing quickly, trading off and harmonizing together. A steady drumming, subtle bass, and notable electric guitar drive sets the stage for periodical yelps and lengthy solos. “The Lorax,” begins as as lower-paced song but includes dramatic electric spurts, balances out, then repeats the electric, instrumental rollercoaster again. The base of the song is a little dreamy with the slow moving bass and Waldon’s dynamic range, along with subtle background vocals. While still undeniably a rock song, it surprisingly doesn’t stray too far from the dream state and otherworldly tone throughout the rockier portion, but rather fuses and intensifies the foundational elements.